Within all the hearts the Lord speaks, the Omnipresent Lord speaks. 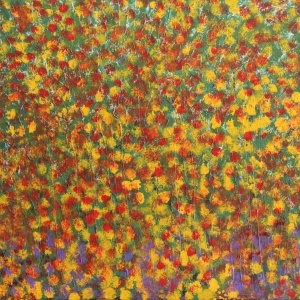 Divine music, the song of unceasing sound vibrations resounds incessantly in each and every heart. We can refer to it as the sound current of the Divine Matrix. It is present in every tiny particle of the whole universe. 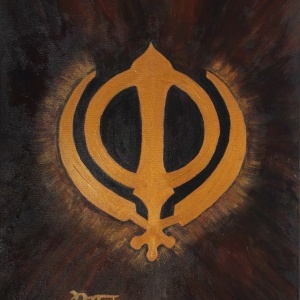 Recognizing this divine link, Guru Nanak, the first Sikh Master encouraged the use of music as a medium to produce spiritual inspiration, a way to produce harmony, a way to find one’s lost inner rhythm. Starting with the Rabab, over time, musical instruments like the Tabla, the Harmonium and various forms of cymbals accompanied the singing of Gurbani (Sikh Scriptures). People around the world respond to music in a universal way because deep inside our own being, music of the sound current is playing all the time. Harmony and peace descend when we intuitively tap into this treasure house, even for a split second. 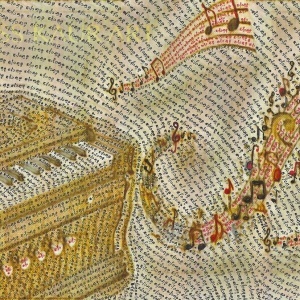 Research has shown that music has the power to change emotional states, change perceptions and physiology, and elevate spiritual awareness; devotional and sacred music can transform both the individual and collective consciousness into heightened states of love, forgiveness, compassion, and physical healing. When we become totally absorbed in the rhythmic sounds produced by these types of instruments, they can transport us to another ethereal realm. 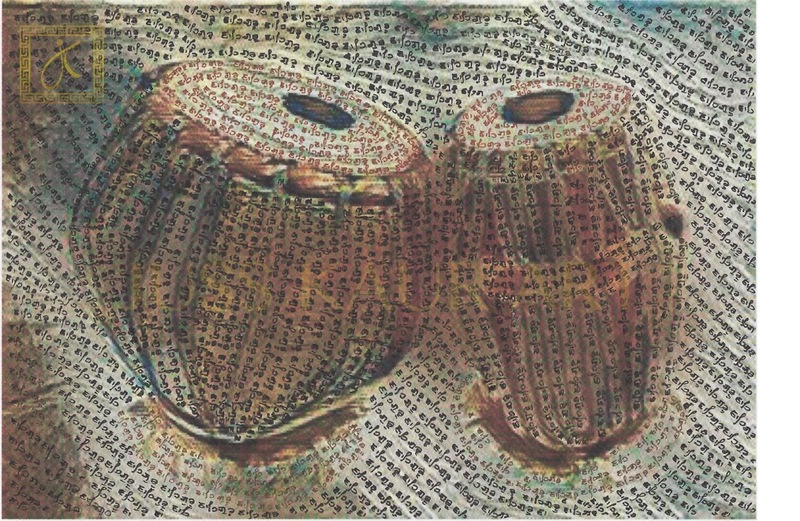 This oil pastel and pen painting reflects on the omnipresence of the Divine music within and without: the word, Waheguru – vwihgurU – pronounced “Wah-hay-guroo”. Wah means Infinite, hay means Thou, and Guru means Higher Self, or the Divine Teacher within each sentient being.